South Africa's newest pass unveiled today in the Eastern Cape between Lusikisiki and Flagstaff. The Eastern Cape Government announced this morning that the cost of R2,6 billion to construct the new road would boost tourism in the old Transkei and that taxpayers throughout South Africa should be impressed with the new road. The pass is named after a famous chief who ruled here in the 1800s ~ hence the Lirpa Loof Pass. Lirpa Loof = April Fool. Most people figured it out, but what is interesting is that the post was viewed by over 40,000 people. Every now and again we hit a jackpot post with phenomenal results, but it is extremely difficult to sustain those big numbers. It's what we call the "Marelise syndrome"
In this bumper newsletter this week, we bring you the first quarter of the Ben 10 Tour - warts and all. We will also be producing a four part video set covering all the highlights of the tour. These will be processed within the next week. If you want to see the photos, please visit our Face Book page. 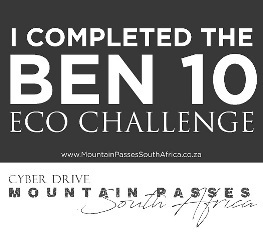 The Ben 10 Eco Challenge was conceived in 2011 whilst on a filming trip in the area as a means to boost local tourism in the Rhodes/Wartrail area by founder of Mountain Passes South Africa – Trygve Roberts. He wanted to create an event that would last indefinitely, attracting adventure tourists into the area. The owner of Tiffindell Ski Resort, Lew Campbell, contacted MPSA and asked us if we would like to film the zig-zag pass above the ski resort to the top of the highest mountain in the area, called Ben MacDhui. Mountain Passes South Africa came up with the concept of driving 10 challenge passes in 7 days and creating a special page on their website dedicated to that cause – the Hall of Fame. With 10 passes and the highest pass being named the Ben MacDhui Pass, the challenge title of Ben 10 Eco Challenge came to be. It was an instant hit and the challenge is going from strength to strength and considered in some circles to be one of the toughest challenges for offroad adventurers. The challenge was opened up to 4x4 drivers, motorcyclists, mountain bikers, runners and walkers. All the passes first had to be driven and filmed and published on the website. In January 2017 Rudi Peters from Gauteng was the first person (other than the filming crew at MPSA) to complete the challenge. He did it on a BMW 1200 GSA motorcycle. In just over 2 years 85 people have now completed the challenge, but those that have entered number 166; showing an attrition rate of roughly 50%. This figure is a constant reminder that the challenge is tough and many an entrant retreats from the mountains in defeat. In this story we take you through an epic four day adventure of our first official tour of the Ben 10 with 14 vehicles and 1 motorcycle. It would turn out to be an adventure of a lifetime – never to be forgotten. The group of 14 4x4’s and 1 motorcyclist arrive at the Mountain Shadows Hotel nestled at over 2000m ASL near the summit of the Barkly Pass. The hotel is ideally suited to our needs with a large lounge and bar area, conference facilities and a big dining area. The rooms are arranged in a horseshoe shape away from the main building which gives everyone quick walking access to all the facilities. VHF radios are fitted by the guides and tyres are deflated in preparation for an early start the next morning. The group has been split into two groups to be more efficient. Mike Leicester, MPSA’s associate from Johannesburg will lead Team Mike and Trygve Roberts will lead team Romeo – each group comprising 7 vehicles. The motorcyclist Francois with his wife Eilleen riding pillion will not have radio comms with the group, but will ride out ahead each day. At the drivers briefing there are a few concerned faces and not everyone agrees with the principle of tyre deflation. The acid test will be up in the mountains. Six months of preparation have gone into the trip. 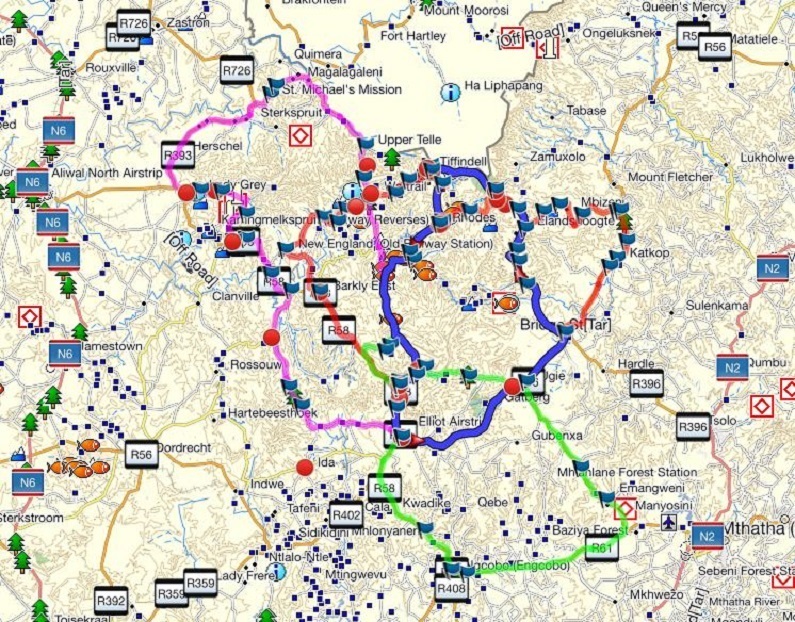 The four days have been split up to cover the 10 challenge passes and in addition another 23 passes have been added into the routes to add some extra pizazz. Everyone is requested to be in the dining room at 06h00 the next day in order to get Group Mike off by 07h00. Group Romeo would leave at 07h30. Each group would operate on different radio frequencies. There were 36 people in the group with the youngest being an 8 year old girl and the oldest being the 75 year old Eugene Fourie – a pathologist. In the group there are lawyers, doctors, vets, IT specialists, school teachers, businessmen, farmers and a few retirees. The convoy vehicles comprised 8 Toyota Land Cruisers and Fortuners, and one each of a Ford Everest, Suzuki Jimny, Isuzu KB250, Nissan Patrol, Mitsubishi Pajero and a Land Rover Discovery G4. The motorcycle was a BMW 1200 GSA. Chapter 3 - Thursday 21st March. (Day 1) Fetcani Pass to Lundin's Nek. Weather forecast - 22C Clear sunny weather. Our route for the day is long, rather than tough. The distance is 382 km and includes the Fetcani Pass, Lundin’s Nek, Dulcie’s Nek, Jouberts Pass, Grondnek Pass, Otto du Plessis Pass and Barkly Pass. The day starts off at 07h00 with heavy mountain mists in the Fetcani Pass region but soon burns off and we are left with a beautiful, clear blue-sky day. The story of the Fetcani warriors is told over the radios of fierce tribesmen in the late 1800’s who caused havoc in the area, torching huts, stealing cattle and murdering all who came before them. They were much feared by local tribes and gave the Cape government (British) at the time a headache. The drive from Fetcani to Lundin’s Nek is stunning. The route traverses valleys between mountains of eroded sandstone forming outlandish sculptures, mellowed by lush green pastures and tall Lombardi poplars reaching for the heavens. The farms have Scottish names – like Reedsdell. The distance passes in a maze of perfect scenery, but ahead the Drakensberg looms and the prospect of tackling Lundins Nek Pass (Lundeans Nek) is on everyone's mind. The road begins deteriorating and soon the convoy is instructed to switch to low range. Deep ruts and washaways interspersed with small rivulets and teeth chattering rocks slow the speed down to under 15 kph. Day 1 is the magenta track. Up ahead the SAPS buildings – an anti-stock theft unit, marks the southern start of Lundins’ Nek Pass – the first of the challenge passes. There is a vehicle parked ahead in the middle of the track. It is stationary. As we get closer, we stare in disbelief. It’s a Toyota Corolla 1.6! How on earth did it make it this far? We stop. The young German couple ask if we think the road ahead is suitable for them to continue. We quickly established that it is a rental car and many a joke abound that a rental car can go anywhere. Here was the proof of the pudding! We managed to persuade them to turn around and go back. The views over the Telle River valley from the summit of Lundin’s Nek are superb. Alpine flowers dot the landscape which mostly consists of rolling grassland. There are hardly any trees at this altitude (2170m ASL). 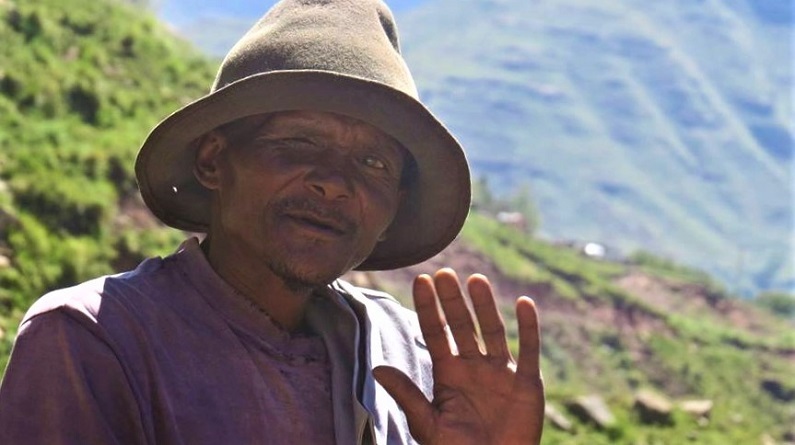 One can see into Lesotho from here, as the sound of a cowbell clanks nearby and the thundering hooves of a stallion ridden by a young Sotho man gallops past our convoy. The descent down the northern side of Lundin’s Nek Pass presents one with exceptional views of weathered sandstone, almost black soil, rich green grass, tumbling rapids of crystal clear water, shiny cattle and flocks of sheep around any corner, calmly controlled by the local herdsmen who all wear a sort of uniform of a blanket, gumboots and a stick. Their dogs are well controlled too and are well adapted to the job at hand. Most of the worst damage to the roadway from 2 months ago has been repaired and the descent presents very few problems. 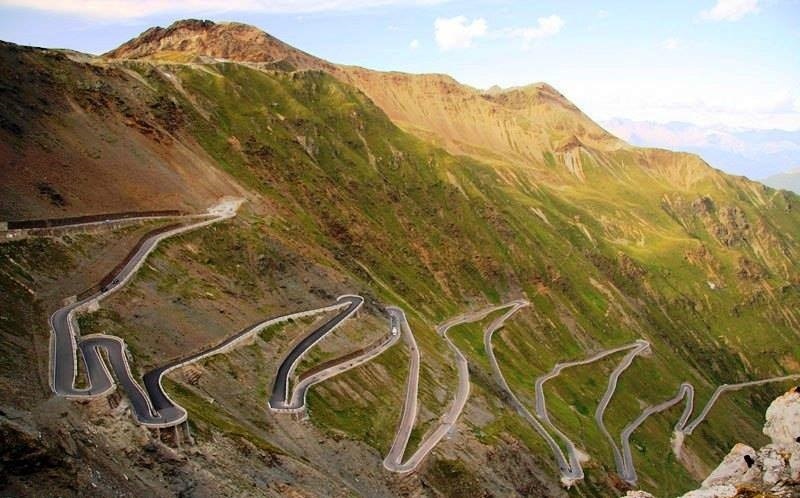 The road has many hairpins and razor sharp corners, so 100% concentration is required. At last we reach the end of the pass close to the Telle River. From this point our route takes us north. Constantly following the river on it’s western side for a long distance through village after village until at last we get to the tar road near the Telle River border post. 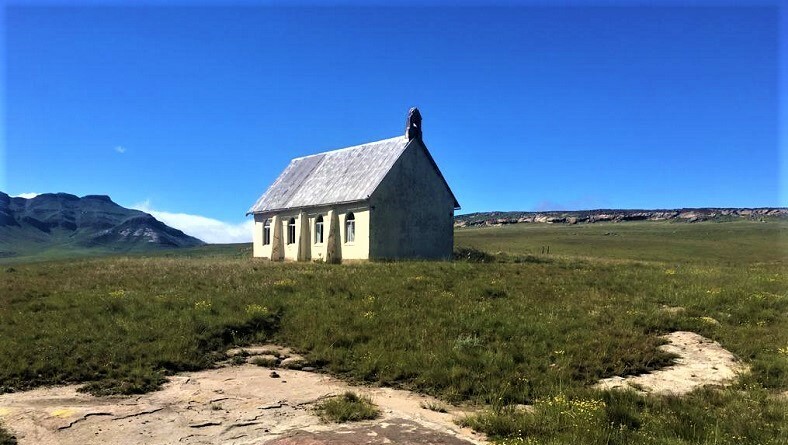 From there we connect with the main tar road to Lady Grey and drive over a minor pass called Dulcie’s Nek, where suffragette Olive Schreiner once lived nearby on a farm. A short while later we drive through the sleepy (but artistic) town of Lady Grey where just a week before riots and civil unrest had residents lock themselves inside their homes. All was quiet as our long convoy rumbled through the town. At the foot of Jouberts Pass we take a lunch break and then tackle the ascent and a quick break at the summit for drivers to take their “proof” photos at each challenge pass summit (a requirement of the event). We follow the eastern descent of Jouberts Pass and begin a very long, but exceptionally attractive gravel road drive of almost 40 km through several farms, each separated by a small pass. There are verdant fields with shiny black and brown cows and here and there a huge bull stands guard over his harem. The bird life is stunning too and we are fortunate to have a number of knowledgeable birders in our group, who identify a number of birds as we proceed along our route. There are jackal buzzards, Cape vultures, kestrels and a number of other interesting birds. Finally we reconnect with the tarred R58 and turn left to drive the minor pass called Grondnek followed by the Kraai River Pass and in a blink we are back on gravel and heading south towards the Otto du Plessis Pass. The condition of the road is reasonable and our group is making good time. The summit shows large billowing white clouds as is so often the case at the top of these big high altitude passes. This one tops out at 2115m ASL. When we arrive at the summit, we are right in the cloud base and the gorgeous views on offer are not visible at all. What a pity – but the weather is always the one factor we cannot control. We stop briefly at the summit for the now familiar process of the signboard selfies and move straight on down the descent. About halfway down we pop out of the cloud-base, but the available light does not make for good photography. All the waterfalls are flowing nicely. We have completed 3 of the 4 challenge passes for the day but the clock is not being kind and the light is fading fast. We head on to the tarred R58 at Ida and connect with Elliot and drive up the Barkly Pass – which most of our guests rated a 10/10 despite it being a tarred pass. We arrive back at base in the dark. Next week we will feature Day 2 - where all the action began with the Land Rover picking up a double set of sidewall cuts (and only one spare wheel).